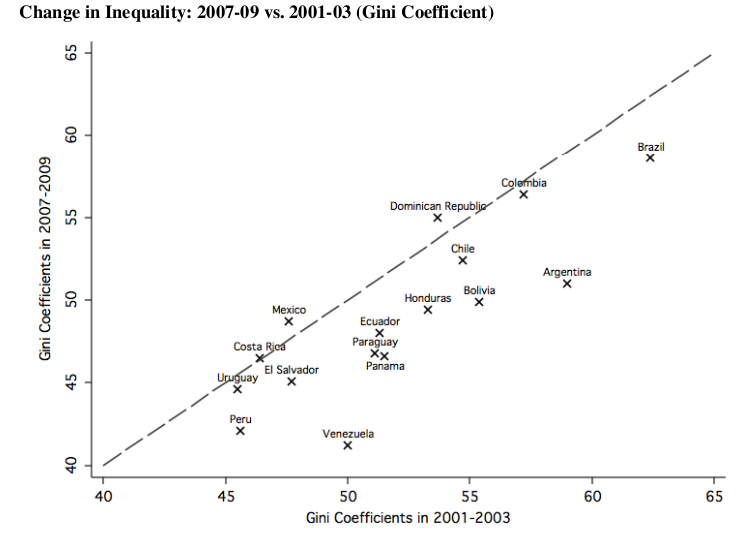 Source: Montecino (2011) analysis of ECLAC data. My colleague, Juan Montecino, has taken a careful look at McLeod and Lustig’s claim about relative performance by regime type and he has written up his findings in a new CEPR report (pdf). Juan’s paper concludes that McLeod and Lustig’s finding depends entirely on their choice of the dataset analyzed. McLeod and Lustig use data for 18 countries in the region taken from the Socioeconomic Database for Latin America and the Caribbean (SEDLAC). When Juan reruns their same statistical tests on the same 18 countries, using instead data prepared by the Economic Commission for Latin America and the Caribbean (ECLAC), the findings are reversed: Argentina, Bolivia, and Venezuela do better than Brazil and Chile. The key difference between the two datasets lies in the handling of the raw surveys. …ECLAC explicitly adjusts the surveys for income underreporting –when households in an income survey underreport their true amount of income, thus biasing the measurement of inequality– while SEDLAC does not. Because income underreporting is likely more pronounced in wealthier households, failing to adjust for underreporting is expected to lead to a lower and biased estimate of inequality. So, using McLeod and Lustig’s methodology, if we don’t take under-reporting by high-income households into account, then the “social democratic” countries do better than the “left populist” countries. If we do try to take under-reporting by high-income households into account, however, then, using McLeod and Lustig’s same methodology, the “left populist” countries do better than the “social democratic” countries. Juan also makes another critique worth highlighting. In the statistical analyses McLeod and Lustig construct to explain economic inequality, they control for total social spending as a share of GDP. Since one way that a “left populist” government might lower inequality relative to a “social democratic” government is precisely by spending more on social programs, it is just plain wrong to “control for” the level of social spending when comparing the two types of regimes. In fact, including controls for social spending, essentially converts the entire McLeod and Lustig methodology into an exercise in measuring the “efficiency” of the two types of governments in translating a given level of social spending into reductions in inequality. This may be an interesting question, but it is not what McLeod and Lustig set out to do. Nor is it likely to be terribly interesting to someone near the bottom of the income distribution in any of these countries, who will likely care much more about the actual impact their government is having on inequality than an abstract measure of their elected government’s efficiency in achieving that result.